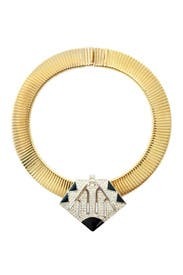 Go for a deco fab look with an Egyptian flare! This collar necklace by Ciner will add a cool vintage feel to your outfit. 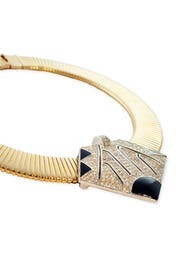 Gold snake chain collar with deco style crystal and black center slide. Box-tab closure. 14" long. Was hoping this fit more like a choker but it's actually a bit too wide for that. Didn't fall nicely against me although it is a gorgeous piece. Perfect statement piece for my low cut little black dress. Very modern and got lots of compliments! This collar from Ciner is truly beautiful. Striking, elegant-it was the perfect accessory for a formal evening out. This bold statement piece made for such a memorable evening. Love, love! This necklace was super fun. Make sure you get the clasp right. My only issue was keeping the pendant in the center of my neck. It has a very 90's vibe, but it's still super cool. If you aren't comfortable wearing a choker, don't rent this necklace. There's no way to make the length longer or shorter, so you are stuck with it up around your neck. 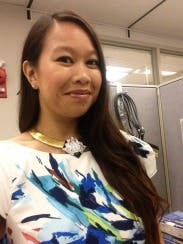 I really enjoyed wearing it and found it to be a super cool statement piece. A really stunning piece! I paired it with a dress I rented for a date. It was very comfortable to wear, although it did flip up a few times so I had to lay it flat against my neck. But dealing with a small thing was worth it for this beauty :) Very hard to part with! I received the accessory as a surprise from RTR. I paid $15 for a stylist to pick an accessory that matched my rental. Best thing I ever did. I would have never picked the necklace myself, it's not style. But the minute I put it on it went great with the dress, did not look like a choker like I thought it would and everyone loved it. I rather pay RTR to pick my accessories all the time.